Call me picky but I just don’t like romaine lettuce. Something about its crunchiness (I like iceberg even less) and bitter taste just turns me off. I’ll use it in a salad if I can hide it among a lot of loose salad greens and spinach, but I just can’t eat it on its own. Or at least I couldn’t, until I tried it cooked. Yes, cooked. Grilled, to be specific. 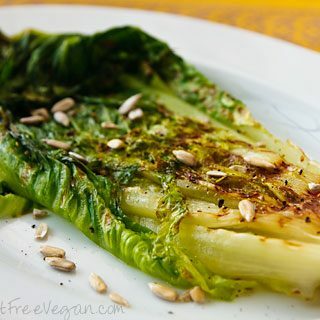 I got this great idea from Ellie Krieger’s The Food You Crave; in her recipe, the romaine is cooked on the barbecue grill, but since it’s January and I didn’t want to wait until summer to give it a try, I decided to see how it would taste grilled on a George Foreman grill. Truth be told, I don’t use my new removable plate grill as often as I should, so I’ve been looking for things to cook on it. As it turns out, it worked perfectly. Two halves of a romaine heart (the inside core of the head, often sold in packs of three) fit easily into the grill, bases placed at opposite ends. 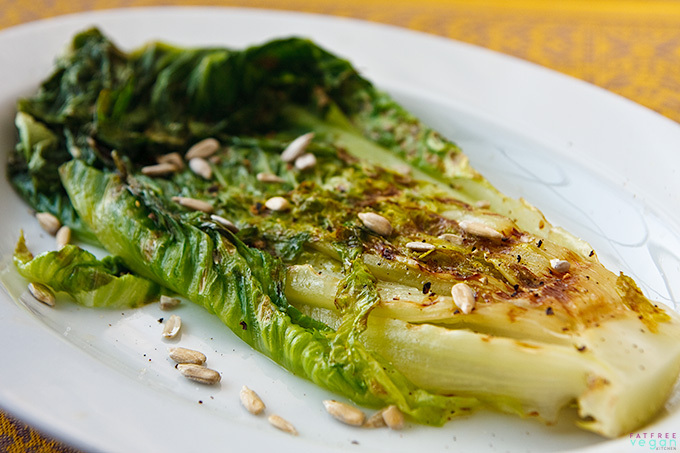 After just a few minutes of grilling, the romaine began to wilt and brown slightly and was done. 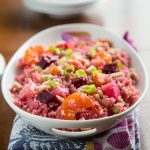 Salad doesn't have to be cold! 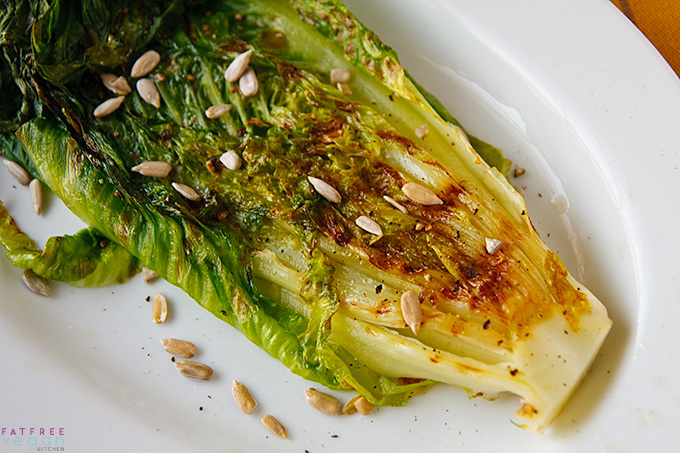 Grill your romaine lettuce and dress it simply with a fat-free vegan dressing and sunflower seeds. Cut the romaine heart in half lengthwise. Trim the stem end a little, if you wish, but be sure not to cut too much–all the leaves need to stay attached. Heat your George Foreman grill or a stove-top grill pan. Spray it lightly with olive oil, if necessary. (You know your grill–if you think it might stick, give it a quick spray.) Once it’s hot, put one romaine half on it, two if they will fit. Close the top of the Foreman grill or press the lettuce down lightly with a spatula if you are using a grill pan. Cook for about 2 or 3 minutes, until lettuce has begun to wilt and grill marks to appear; then, if you’re using a grill pan, turn over and grill for another 2 minutes. 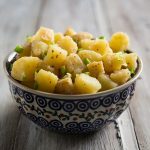 Place on two plates, cut side up, and sprinkle each with 1/2 teaspoon vinegar, 1/2 teaspoon sunflower seeds, and freshly ground black pepper to taste. Serve while still warm. One or two servings count as zero points on Weight Watchers Freestyle. Previous Post: « Happy 3rd Birthday, FFVK! Amazing and innovative find! Also great with some hot and sweet mustard, salt and pepper on top! Thank you! I misplaced my olive oil somewhere, so I made this with sesame oil and put rice vinegar and soy sauce on top – yum!! The Foreman grill is a great idea, as is splitting the romaine. I’ve been playing with trying this in my (gas) broiler, and it is delicious, but the interior leaves are still quite crisp. Nice, but I love that warmed/ seared flavor on the outside. Splitting the heads (unless they are really small) would help. Sunflower seeds are a perfect accent too. Thanks! Cut Fruit in chunks and spread evenly on the four halves of Romaine. Hi! I was looking all over for the perfect vegetable side dish to a romantic birthday dinner- and THIS IS GOING TO BE IT! 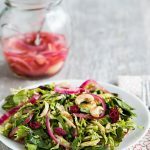 It’s so easy, I can focus on the other components, this looks delicious, and more special than a regular tossed salad! I am so pleased to have found this! Thank you!! I’m lazy and therefor need thing to be “ridiculously easy” to prepare. Will give this recipe a shot for sure! What a great idea! 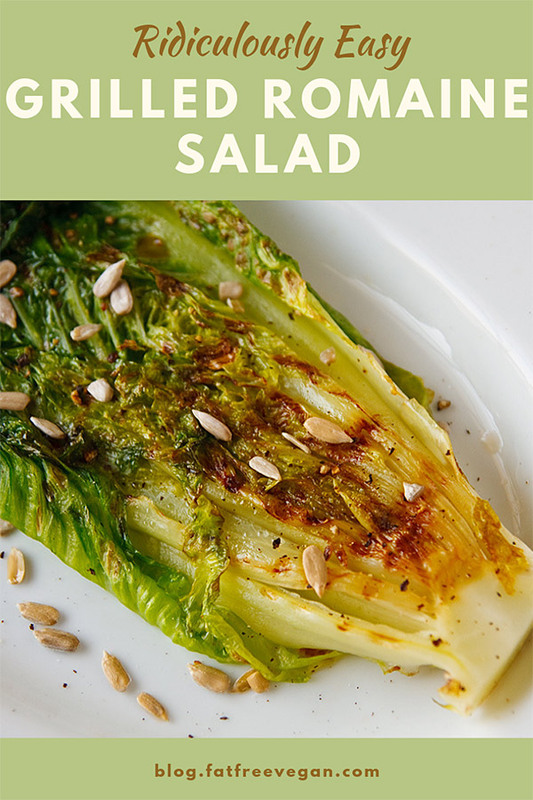 I have some romaine in the fridge, and I had no idea what to do with it – until now!! Thanks for sharing!! We just got a Cuisinart Griddler for Christmas…can’t wait to try this! Thanks for this – had it for lunch, it was great! I got a big George Forman grill recently and love finding new recipes for it. I didn’t use the sunflower seeds and threw some mushrooms on the grill with the lettuce and added golden potatoes to the mushrooms for a side dish. Lovely lunch, thanks again! After dipping my toes in for quite awhile I just committed to a vegan way of eating. I think your website is going to be one of my new favorites. I did not want to trade in a meat based, high fat, high cholesterol diet for a fat filled vegan one. Looking forward to trying your wonderful sounding recipes. so this might be one way to eat the Romaine ! I haven’t tried it broiled, but I suppose it would work. You could also try cooking it cut-side down in a hot skillet on the stove. I found out about this recipe from friends. 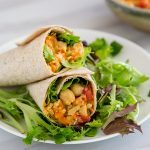 It’s SO simple and tastes amazing! I love it so much that I wanted to share it with my readers at lottelee.com. Thanks for a great recipe to use on the grill this summer! Made this today and served it with chipotle bean burgers and corn, red pear, and black bean salad. No sunflower seeds so sprinkled toasted chopped pecans on the romaine. Big hit!